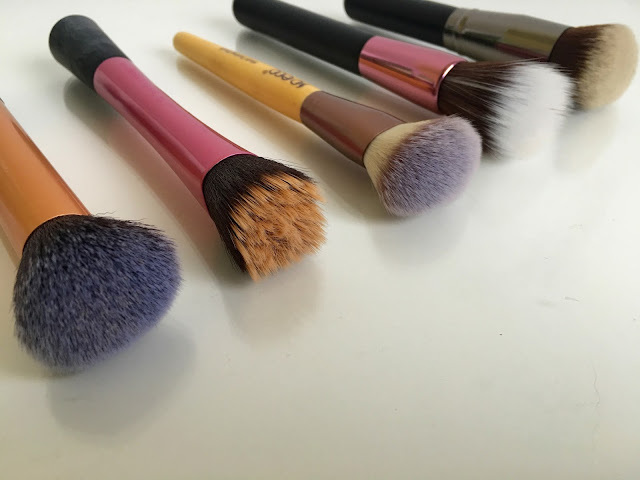 I don't know about you, but I am such a makeup brush hoarder, I have brushes for everything; base, eyes, lips, cheeks, powder products, liquid products... I could go on. Although I love my collection and treasure every brush I have, sometimes I prefer a hassle free makeup day, and that's where the multi tasking brushes come in handy. Don't get me wrong, I love applying makeup and some days I really enjoy sitting and spending time perfecting my brows and attempting that liner flick but some days speed is needed and with the help of some multi taking brushes that can be achieved... less tools, less mess, less time. The first multi taking brush I ever used was the Real Techniques Buffing Brush which in all honesty can be used for a multitude of products... I've been known to grab this when using liquid foundation, pressed powder, bronzer and blusher, but I favour it for the foundation and powder the most. The bristles are incredibly soft yet really densely packed, which allows a lot of control, especially when using this with a liquid foundation, I can concentrate on areas where I need more product and really work the product into my skin to give a smooth, even base to my makeup. When I need to set my foundation with a powder this does the job perfectly, it picks up plenty of powder with ease and distributes it evenly onto my face... the best thing about using this for both steps is that there's no need to wash the brush in between products, a big bonus when you hate washing brushes as much as I do! Another favourite from Real Techniques is the Stippling Brush which I predominantly use for applying cream based bronzers and blushers, it blends them out wonderfully to give a sheer, natural finish to the skin. I have also found myself reaching for this to apply liquid foundation with... although it's a fairly small brush it buffs foundation into my skin to give a really flawless base, and works especially well with serum based foundations like bareMinerals 'bareSkin'. A brush which is very similar to the RT Buffing Brush is the So Eco Multi Tasking Brush which just happens to be the cheapest out of all of these brushes. You would never know this was a budget option though... I would actually rate the quality of this brush as better than the Real Techniques option! 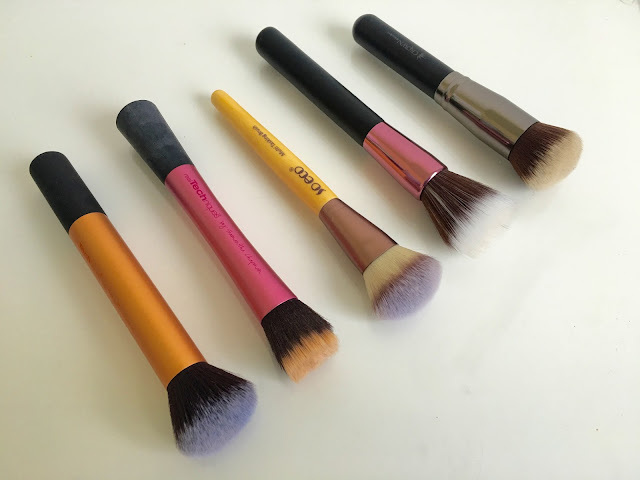 The bristles are really dense, but oh so soft which is the perfect combination for applying foundation of any consistency; liquid, gel, cream, powder... this works well with them all and with small circular buffing motions a flawless finish is easily achieved. Because of the size of the brush (it's on the smaller side), I've been using this to apply powder contour products to my cheeks and blend out the product seamlessly and I have also been known to blend out my concealer with the tips of the bristles, because it's so soft and gentle this works really well. So Eco is an eco-friendly and cruelty free brand who use sustainably sourced bamboo for the brush handles and recycled aluminium to hold the bristles in place, even the packaging is biodegradable... a real selling point for me and even better, there's free 1st class delivery available on all brushes from the range with MakeupBrushes.co.uk. Most recently I added the Creative Max Finest Finishing Airbrush into my collection and it's taken up place in my daily morning makeup routine for using with applying my powder bronzer when I want an allover glow. With it's duo fibre bristles it's really easy to get a fine, light dusting of product without going in too heavy, which is ideal for daytime bronzer and for blending the product down my neck. It can of course be used to apply powder blushes and highlighters and thanks to it's flat edge it's easy to gain control of where the product is placed on the face. For a light base with either powder or liquid foundation this works really well too... the bristles are really soft and will lightly buff the product onto the skin, for a higher coverage base I would recommend another brush though, as these bristles are so soft you can't really work the product into certain areas more than others. Finally, the only brush I own from this brand (how on earth?! ), the Crown Brush 'C451' which I reach for when I'm applying a higher coverage or thicker consistency foundation as the finish with this one is just so good. It can blend and buff anything to just look like flawless skin with hardly any effort at all... The vegan, synthetic bristles don't allow any product to be absorbed into the brush, so there's hardly any product wastage and the fact that the bristles are so short and compact means that the product can really be worked into all areas of the face, helping to achieve that high definition finish to the makeup. So Eco win hands down for value for money, Crown Brush probably just pip the others to the post for the best finish on the skin (although this could be arguable depending on the foundation used) and Real Techniques is the real all rounder of the bunch. Do you have many brushes that you use for more than one beauty task?